Xu Bing was awarded the Medal of Art for his longtime contributions to Art in Embassies and cultural diplomacy on January 21, 2015. Xu Bing finds his family roots in Wenling of Zhejiang province. He was born in Chongqing, China in 1955. In 1977 he entered the printmaking department of the Central Academy of Fine Arts, Beijing (CAFA) where completed his bachelor’s degree in 1981 and stayed on as an instructor, earning his MFA in 1987. In 1990, on the invitation of the University of Wisconsin-Madison, he moved to the United States. Xu currently serves as the Vice President of CAFA. Solo exhibitions of his work have been held at the Arthur M. Sackler Gallery, Washington DC; the New Museum of Contemporary Art, New York; the Joan Miro Foundation, Spain; National Gallery of Prague and the Spencer Museum of Art, Kansas, amongst other major institutions. Additionally, Xu Bing has shown at the 45th and 51st Venice Biennales; the Biennale of Sydney and the Johannesburg Biennale amongst other international exhibitions. Over the years, Xu Bing’s work has appeared in high-school and college text-books around the world including Abram’s “Art Past – Art Present,” Gardner’s “Art Through the Ages” and Greg Clunas’s “Chinese Art” a volume in the “Oxford History of Art” series, Jane Farver’s Global Conceptualism: Points of Origin 1950s – 1980s (Queens Museum of Art Press) and Art Worlds in Dialogue (Museum Ludwig Press). In 2006, the Princeton University Press published “Persistence/Transformation: Text as Image in the Art of Xu Bing” a multidisciplinary study of Xu Bing’s landmark work “Book from the Sky.” In 2008, Professor Robert Harrist, Chair of Chinese Art at Columbia University, New York, began teaching a graduate seminar entitled “The Art of Xu Bing.” In 1999, Xu Bing was the recipient of a MacArthur Fellowship in recognition of his “capacity to contribute importantly to society, particularly in printmaking and calligraphy.” In 2003 Xu Bing was awarded the Fukuoka Asian Culture Prize, and in 2004 he won the first Wales International Visual Art Prize, Artes Mundi. 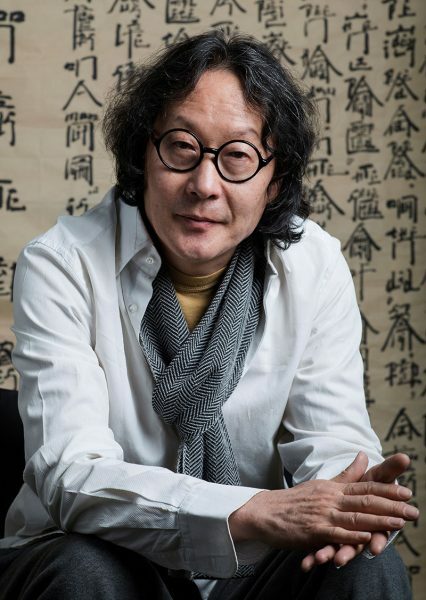 In 2006, the Southern Graphics Council awarded Xu Bing their lifetime achievement award in recognition of the fact that his, “use of text, language and books has impacted the dialogue of the print and art worlds in significant ways.” “Art in America” listed Xu Bing, along with 15 others, in their annual Year in Review. Is awarded Doctor of Humane Letters by Columbia University in 2010.